Bracing has traditionally been taught in the earliest period of a paddler's development. A novice paddler will feel nervous on getting in a narrow kayak, and they will wobble as the nervous system controlling the core muscles learns how to react to correct any instability in the craft. Therefore it is understandable that their first priority is to correct this instability as soon as possible so that they feel more comfortable. It is also understandable that a coach with a novice paddler will react to this demand by teaching basic braces to instil the confidence to allow them to progress with their learning. It is my firm belief that teaching brace strokes this early in a paddler's career is harmful, both to their long term development, and also to their ability to avoid injury. Description of the various brace strokes. There are two basic types of brace strokes commonly taught to beginners, the high brace and the low brace. The high brace involves supporting off the drive face of the blade while it is held flat on the surface of the water. . The low brace involves supporting off the back face of the blade, again while it is held as flat as possible on the surface of the water. The high brace has come in for a lot of criticism over recent years as it has been the cause of many shoulder injuries, and nowadays many coaches only teach the low brace. The method of teaching both these strokes is roughly the same; the paddler is asked to rock the boat over to one side while holding the blade just above the water, then they push down on the water while they rock the boat back upright. While performing this exercise, the body remains vertical over the boat, and in actual fact the paddler could right the boat without ever placing the paddle in the water. The paddler is never actually capsizing. If the paddler actually moves the head over the edge of the boat, as would happen in an actual capsize situation, simply pushing down on the blade would not restore equilibrium, as the body is righted, the blade sinks in the water, and the body inevitably follows it. The answer to this problem is to prevent the blade from sinking in the water by using a sculling action across the surface. With the low brace the blade will start behind the paddler and move forward across the water while the paddler moves his body forward to lower his centre of gravity to assist in the righting of the boat. With the high brace the blade will start at the bow and sweep around to the back of the boat, and the paddler will finish leaning back. This has two unfortunate consequences; the first, and of greatest concern, is that in the event that the support fails, the upper arm will be behind the paddler, and raised above the shoulder, putting the shoulder in a very vulnerable position; the second is that when the paddler is leaning back he will not be in a good position to control the boat. There is a second option for the high brace, of sculling the blade forwards which could be argued has the benefit that the paddlers arm finishes in front of his body, and he will be leaning forwards at the end of the stroke. It is normal during the course of the lessons that the novice paddler is always prepared for the capsize, whether they are rocking the boat over themselves, or the coach or another paddler pushes them over, so they do not discover how to react in a live situation. Also they are learning on flat, non-aerated water in a static situation, and the techniques do not transfer well when the boat is moving on agitated water. The paddler having learnt their brace strokes now ventures onto moving water and into a situation that might cause them to capsize. If the paddler is able to predict that they might be doing something that might cause instability, they will often assume a defensive position by setting up their brace prior to becoming unstable. Commonly this will be crossing eddy lines, whether breaking in to or out of the current, or else while travelling down a section of disturbed water such as a rapid or a fall. It has been common in the past for coaches to teach the low brace as a method of maintaining stability while crossing eddy lines. 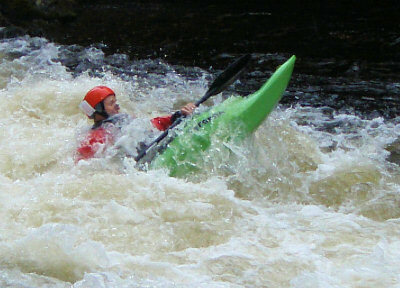 Although this will work to a degree on the gentle eddy lines found on most grade 2 water, this is not good technique for white water, as it is then important to maintain speed across the eddy line to prevent the boat turning too early and failing to cross the eddy line. The low brace has a braking effect upon the boat, exacerbating the problem. Furthermore, when breaking in to the current, you will generally aim to get into the middle of the flow by the time you have turned downstream. A high brace can also be used in the same situation, with the small benefit that at least the paddle is held in a position where the blade angle can quickly be adjusted to drive the boat forwards. It is often argued by coaches teaching this technique that this method can gradually be adjusted by lifting the upper arm until the paddler is performing a bow draw stroke. In my experience it has proved to be difficult get paddlers to make this conversion and for this reason: in the high brace the paddler puts their weight towards the active blade, whereas with the bow draw the blade should not be weighted, or for more aggressive turns the weight should be away from the active blade. Once a paddler has learnt to weight the blade, they find it a huge leap of faith to go away from the comfort of leaning on the blade. Also the high brace turn is very close to the high telemark turn as taught in the early days of whitewater kayaking, and this once again puts the shoulders in a very vulnerable position. The other use of the low brace as a pre-emptive support stroke is when travelling down a rapid. Once again the low brace is effecting a braking effect slowing the boat down. This can be useful in the case of an easy lead in to a more complicated rapid as it gives the paddler time to pick out his line. However, once the water gets more complicated, it becomes important that the paddler becomes proactive in driving the boat along the chosen line. The use of the low brace will slow the boat, and once that happens the paddler is at the mercy of the currents, and is no longer in charge. Finally pre-emptive bracing is often used when passing through a hole. Sometimes the paddler will hold the paddle horizontal so that both blades hit the wave at the roughly the same time. This has again has a braking effect upon the boat, and depending upon the power of the breaking wave this can be very severe, stopping the boat dead leaving the paddler at the mercy of the hole, either getting violently tail ended or otherwise ending up stuck in the hole. At other times the paddler will approach the hole trying to predict what is going to happen to the boat, and will edge to one side putting the paddle out on the same side in either the low or high brace position as some kind of outrigger. What commonly happens here is that just at the point where the paddler wants the maximum support from the blade, the paddle is in the white foam of the breaking wave and all support disappears. The blade, being already weighted, sinks under the foam pile and the paddler capsizes, sometimes violently when the upper face of the blade is caught by the green water coming into the wave. Of course, it is not always possible for the paddler to predict when (s)he will become unstable, especially if (s)he is a novice paddler, and this is when reactive brace strokes are often used. Generally, it is not possible to bring the blade into position for a low brace if it is not already close to that position. The exception is when the boat tips towards the blade that is in the water, when the paddler has almost completed the stroke and is about to lift the blade out of the water. If the paddler reacts quickly he can sweep the blade forwards effectively preventing capsize. In all other situations the low brace can be discounted as a method to prevent capsize. That then leaves us with the high brace. As described earlier, the novice paddler has been taught to strike down on the surface of the water to prevent capsize. The problem here, is that it takes some time for the paddler to react and bring the paddle into position, by which time the boat is often past the point where the paddler is able to keep his head within the space above the boat, and his body is falling towards the water very quickly. In order to strike the water, (s)he has to raise the supporting arm above his or her shoulder, and then (s)he has to strike the water very hard to stop the accelerating body. This is the worst situation - the arm is in a position where the shoulder is unable to resist injury, and the force is very high, and shoulder dislocation is far too often the result. The paddler has reached through the stopper, putting his blade deep into the green water. This maintains stability and drives the boat through the stopper. 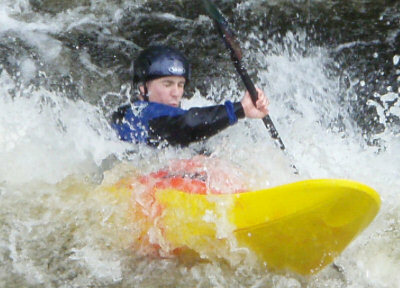 So what should the aspiring whitewater paddler do to avoid capsize? In all these situations the answer is the same, whenever the paddler attempts a manoeuvre that involves crossing confused water where the boat is likely to become unstable, the paddler must adopt a proactive paddling style, driving the boat across the feature. This must be achieved with the strokes being performed with the paddle shaft close to vertical, and with only sufficient weight being put through the blade to maximise the effectiveness of the stroke. To understand why this works it is important to understand the dynamics of the paddle stroke. To the uninformed observer, the drive is the result of pulling the paddle through the water. In actual fact a large part of the drive comes from the top hand driving down through the shaft, especially at the beginning of the stroke. If we go back to Newtons laws that we learnt at school, for every action there is an equal and opposite reaction, so the harder the paddler drives down on the shaft, the more weight can be put on that side of the boat. Now the paddler is no longer simply balancing the boat while (s)he propels it along, so long as the blade is being actively engaged in the water a stable platform is provided between the waterline of the boat and the paddle. This vastly increases the stability of the boat and paddler, and it will take much more force to upset this platform. Of course, sometimes the paddler will encounter a feature that will upset the boat to a greater extent than can be resisted by the stable platform described above. It the paddler starts to capsize towards the active blade, the solution is simply to lean harder on the blade, pushing it deeper in the water, and often the boat will recover its stable position. What is less obvious is that the paddler is equally able to react to a force capsizing him or her away from the active blade. In this case (s)he simply pulls hard on the lower hand, in the extreme twisting the blade towards the boat, and this will often allow him or her to recover the boat. In both these cases, the paddle is maintained in a vertical position which has a further advantage over a brace stroke: If the blade is held horizontally it is difficult to extract it from the water, and this often results in the paddler capsizing even after the feature has been passed; with the blade held vertically it is simply brought out of the water in the normal way. Finally, if this fails, the result is likely to be a roll. Sometimes it is possible to avoid a complete capsize by performing what I call a high brace recovery stroke. This has often come in for a lot of criticism, which is understandable given its obvious relation to the standard high brace as discussed above. There are important differences though; the high brace recovery can only be performed adequately if the paddler's head is immersed in the water, and is in actual fact far more closely related to the screw roll than the high brace support stroke. For this reason, it cannot be taught to the novice paddler. So, what is the point of brace strokes? Brace strokes come into their own when surfing waves or holes. The low brace is the first position that is adopted when side surfing, the high brace can be adopted when looking to drive out of the hole. Again, surfing holes and stoppers is advanced technique, and the paddler need not learn the brace strokes until they are ready to develop this skill. At the start of this article I suggested that teaching brace strokes early in a paddler's career is harmful to their development, and now I will expand upon this. The paddler needs to understand how maintaining an active blade in the water confers stability. Once a novice paddler has been taught brace strokes, it is very difficult for them to modify their behaviour. Bracing gives them confidence since it prevented them from capsizing, so whenever they approach a situation where their confidence is challenged, they continue to brace. This even happens when a coach has specifically told them not to brace. Very often they will paddle towards the feature confidently as instructed, but at the point where they should be driving over the feature, they allow the blade to trail in the water in the low brace position. Even when it can be shown that their bracing is contributing to capsizing, they are unable to change the behaviours they learnt early in their career. On the other hand, when paddlers are not taught brace strokes, but are simply told to paddle from one spot to another, they learn how to maintain stability by the use of the active blade. This is especially so when the novice paddler is introduced to the sport on moving water, they very quickly learn to control the boat with the use of the core muscles rather than relying upon an outrigger. Since they never learn to rely upon the support of a horizontal paddle, this allows them to make much quicker progression in learning the more advanced strokes and techniques. It is for this reason that I do not teach brace strokes any longer to any novice paddlers. The above is not to say that the brace strokes, especially the low brace, don't have their place in general paddling. They can be very useful when used in the right situation. They should simply become just another piece in the paddler's armoury, rather than the default position when faced with a technical piece of water.